There are several reasons Moriarty’s one of the best antagonist’s of all time. He’s up against one of the great protagonists of all time, he’s a doppelgänger for that protagonist, and–in this version–he’s so insane that he’s more powerful than the protagonist. (There are lines that Sherlock won’t cross that Moriarty can’t even see.) Because of that symbiotic relationship that Moriarty has with Holmes, this plot of transference of guilt is brilliant; Moriarty could and does argue that everything he has done could just as easily be the work of Holmes, and it’s so logical that the entire country buys it. So in a sense, the conflict in this story is over Sherlock’s identity, who’s going to control it, who’s going to profit from it, who’s going to die over it. 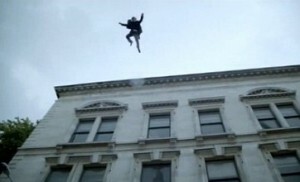 It isn’t just that Moriarty wants to bring Sherlock down, de-fang him, it’s that he wants to become one with him, so that Sherlock isn’t just fighting for his physical life, he’s fighting for his reputation, his legacy, with a foe who will die to take it from him. Much as Aristophanes theorized that people in love were once the same person, and their search to be re-unified fuels their passion, so Moriarty’s recognition of Sherlock as his opposite number fuels his passionate pursuit and ultimate consumption of him. On a thematic level, it really is brilliant conflict, creating not only great scenes as the plot escalates, but roiling the subtext beneath. But while the episode does a great job of making me furious at Moriarty and sympathetic with Holmes, forever playing catch-up with a faster foe, and while the conflict is clear and strong and drives the story, the story is also smug in the way it plays its secrets and above all in the way it keeps Watson and the viewer in the dark for what appears to be no reason. (And having seen “The Empty Hearse,” I repeat, “for no reason.”) The best Sherlock episodes leave me enthralled and delighted, the worst leave me disappointed and frustrated. This was one of the latter, even though it was a brilliant concept, brilliantly acted. In the end, I think the concept overwhelmed the human element, shot the central relationship in the knee, and privileged more secrets from the viewer over viewer satisfaction.